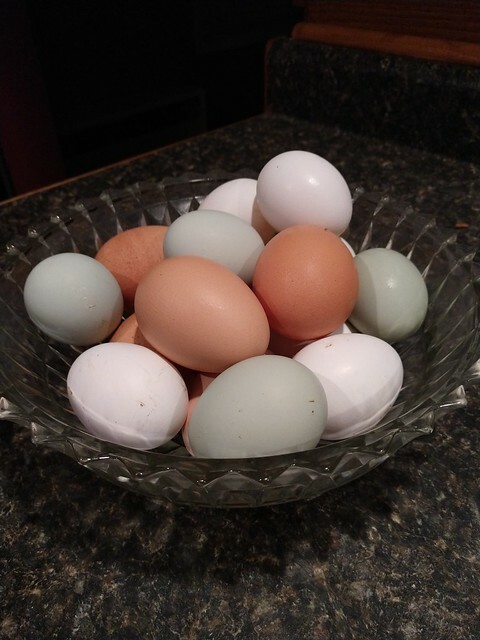 When I first learned there were chickens that laid green eggs, I immediately made up my mind that one day I would have some. Of course, our chickens are still awhile away. 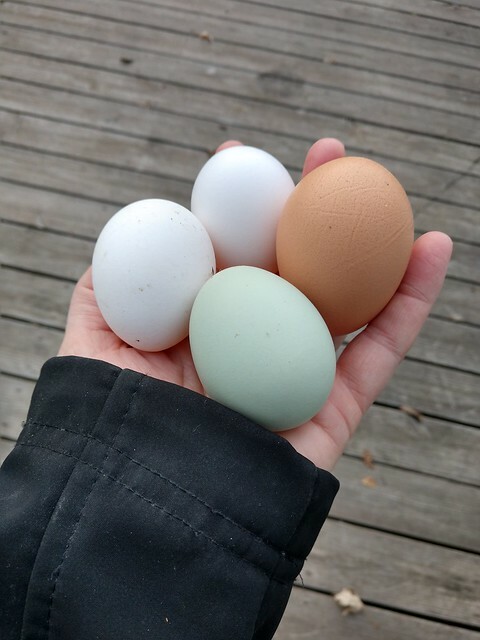 So for now, I’m continuing to live vicariously through Sarah in Illinois and her expanding flock–which now includes a green-egg-laying hen. In my last post I introduced my new chickens and mentioned that while I was expecting to get three Leghorns, I got one surprise Easter Egger. If you remember I was waiting patiently to find out what color egg it was going to lay. I should have emphasized to Steve how excited I was and how closely I was watching every day to see what was laid. Because one night I got home late and Steve collected the eggs for me. He said nothing about them. The next morning I was opening the carton and this is what I saw. I texted him at work and asked why he didn’t tell me that we there was a green egg! His reply was, “oh, there was?” He clearly was not as excited as I was. A couple days later I gathered my second green egg! 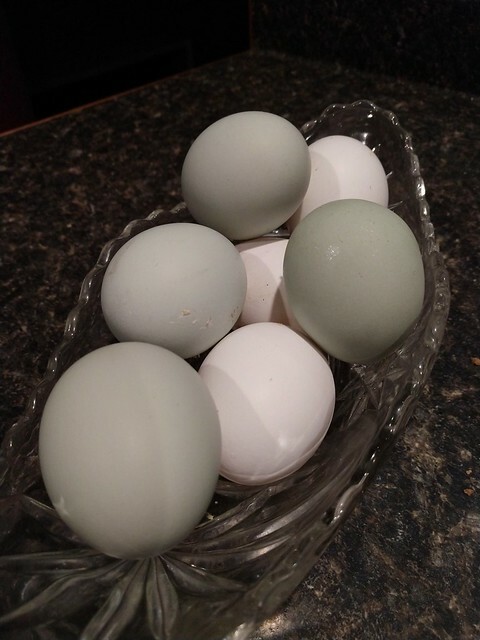 The green eggs are appearing a little more regularly now and you can really see how green they are when sitting next to the pure white Leghorn eggs. 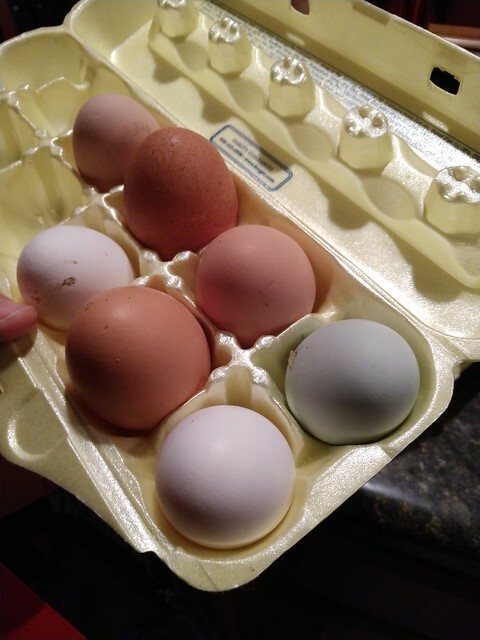 I just can’t get over how beautiful the selection of eggs is. Nature really does have the most beautiful palette. That is a beautiful bowl of eggs, Sarah. What a treat to have that in your own backyard.